​Every year, thousands of bikes are lost or stolen in Minneapolis. Many are recovered but due to a lack of identification, few are returned to their owners. The Minneapolis Police Dept (MPD) has created a free and easy, online way to register your bicycle. You will need to include your bike's serial number, a description of the bike, including make and model, and your contact information. Click on this link to register your bike and in the event it is lost or stolen and recovered by the City, it can be returned to you quickly! Minneapolis has been voted at the top for biking cities in the country with 167 miles of bikeways. In 2011, 37 miles were added along with new bike markings on the roads. The City has produced two videos to help road users understand these markings so both bikes and cars can safely use the same streets. 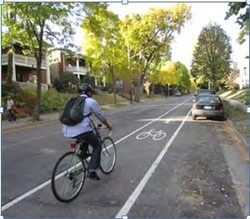 Learn more about biking in Minneapolis.